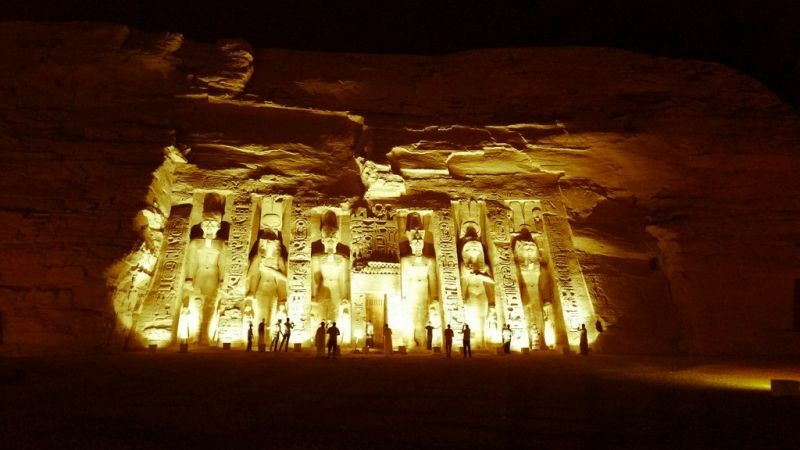 The Abu Simbel Temples are one of the most special places in Egypt. Pharaoh Ramses II had the series of monuments commissioned in the 13th century BC on the southern edge of his kingdom. He wanted to mark the border of his land and inspire and intimidate foreigners coming in to Egypt. Most people would definitely say that he was successful in his attempts. Although they seem like monuments to Ramesses II and his wife, both temples are actually temples dedicated to the gods. The larger temple with four huge statues of Ramesses II seated in front of it is dedicated to Amun, Ptah, and Re-Harakty. The second temple, still huge although significantly smaller than the first, was built to honor Ramesses favorite wife, Nefertari, and is dedicated to the goddess Hathor. 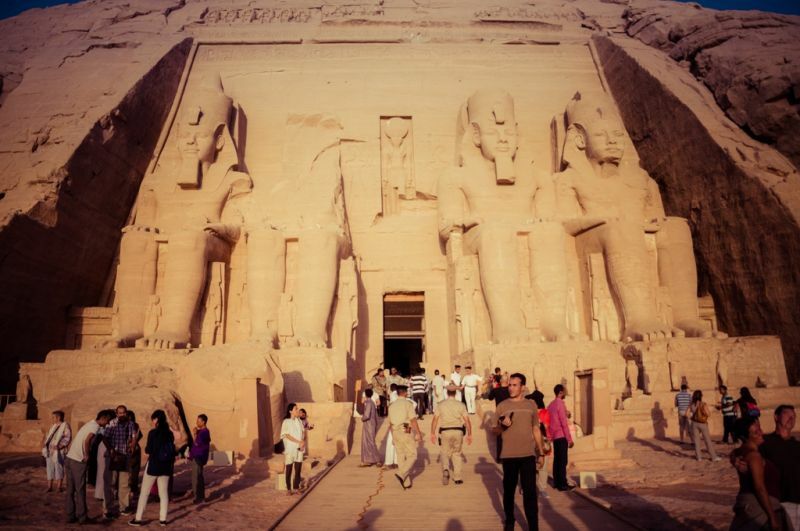 The temple has six colossal statues on its facade, four depicting Ramesses and the two showing Nefertari. The second temple is significant for the status that is affords to the wife of the pharaoh, depicting her several times on equal footing with the pharaoh. The two temples carved out of the hillside are decorated with hieroglyphs that commemorate Ramses II’s major victory at the Battle of Kadesh. A 65-foot tall seated statue of Ramses II greets you at the entrance of the temple while inside an even grander 108-foot tall Ramses statue watches over everything. Once entering the great temple, there are a series of rooms decreasing in size all dedicated to Ramses himself and to important members of his family. (Ramses II definitely wasn’t the most humble man of history!) The final room, the sanctum sanctorum, remains in darkness all but two days of the year. This was not done on accident, it took all of the ancient Egyptians’ knowledge of science, math, architecture, and astronomy to accomplish this. This site south of Aswan along Lake Nasser’s shore is the most famous in all of Egypt after the Giza Pyramids. Built by the greatest of the pharaohs, Ramesses II, these huge rock-cut temples marked the southern boundary of the Egyptian Empire with Nubia at the peak of its power during the New Kingdom. They were meant to convey the power of Egypt’s rulers to anyone who laid eyes upon them. The ancient architects positioned the temple so that sunlight would reach the holiest room on February 22nd, the anniversary to his ascension to the throne, and on his birthday, October 22nd. On these two dates, the sun rises and illuminates the temple corridor back more than 200 feet to three of the four statues in the sanctum sanctorum. 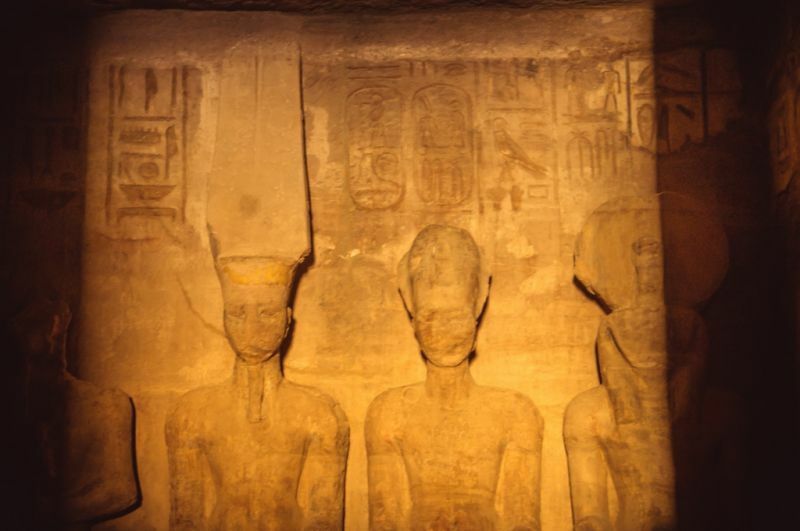 The first three statues are of Pharaoh Ramses II, Ra the sun god, and Amun the king of the gods. 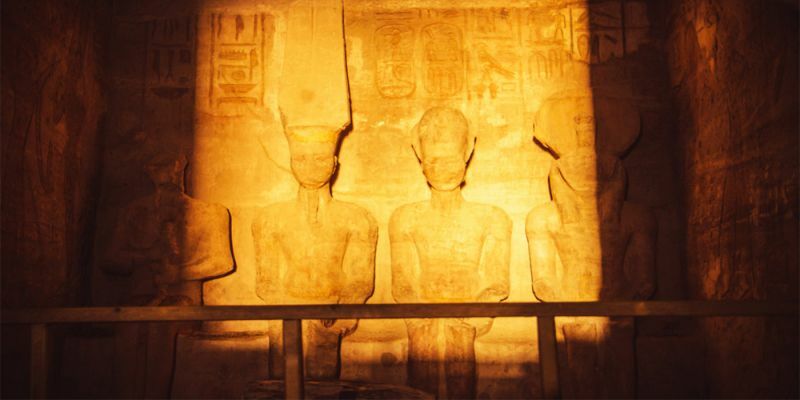 Ramses included himself with the gods because, as pharaoh, he considered himself a god. The fourth statue remains in darkness because it represents Ptah, the god of darkness. This statue has never seen sunlight in over 3,200 years! The amount of planning and effort that must have gone into making all of this symbolism work, is what makes this temple truly impressive. One small mistake and our god of darkness gets light, or one calculation error and the sun doesn’t reach all the way back. The ancient Egyptians were true architectural geniuses! They must have been effective in this capacity because the great statues of Ramesses and his wife Nefertari that adorn their facades are still awe inspiring today. The four statues guarding the doorway to the larger of these temples are the largest sculptures that survive from the pharaonic era. Very early in the morning large crowds gather to wait for the sunrise. Many people take this opportunity to meditate and find a sense of peace before the festival starts. Contemplate the vastness of the ancient Egyptian world, and the innovation and intelligence that created the beautiful space. At sunrise, the calm turns into excitement as people crowd together to get a good look at the marvelous sight of the three statues bathed in sunlight. Once the sun rises too high and the statues fall back into shadow, everyone eats, drinks, dances, and celebrates. The day is full of fun and excitement. You’ll see traditional singers and dancers showing off their skills. There are artisans of all kinds sharing their trade. There is also plenty of opportunity to try delicious local Egyptian food. 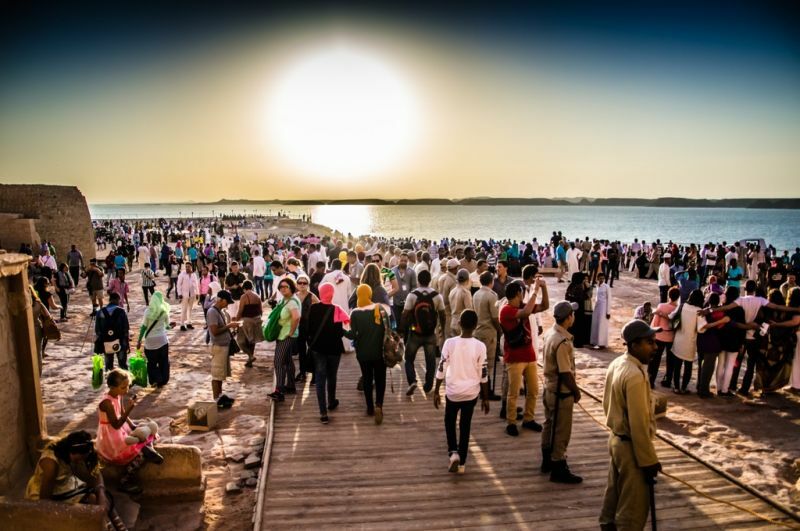 Meet some friendly locals and get to know today’s Egyptian culture as well. This is more than just a cool solar experience, it is a festival that celebrates culture, history, and science! 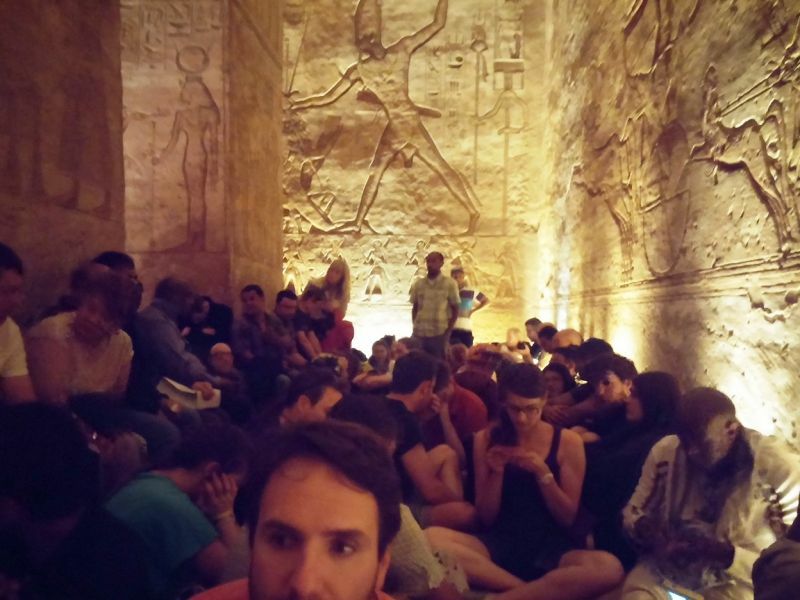 Check out our tours that include the incredible Abu Simbel Sun Festival!